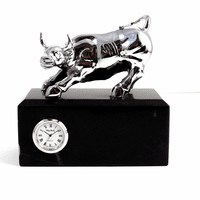 FEATURES/SPECS A unique, fun gift for your favorite wall street trader, this desktop sculpture features the symbols of the financial industry, the bull and the bear. The sculpture is made of brass and showcases both the bull and the bear wearing boxing shorts and boxing gloves, each hand painted in vibrant color. 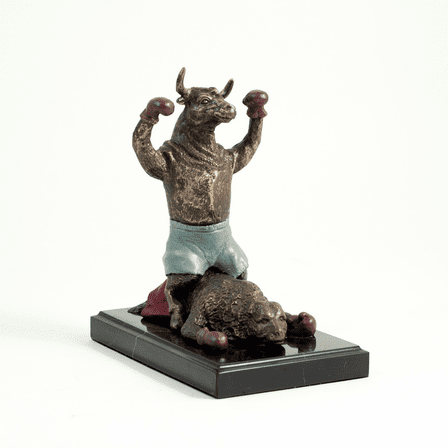 The bear is lying flat on his stomach with the bull straddling him, his triumphant hands in the air. 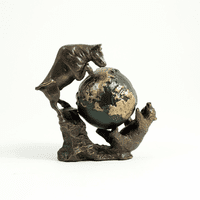 This brass sculpture is mounted on a solid marble base. 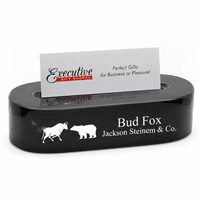 It will look great on any trader or stock brokers desk, giving them a laugh during their stressful day. 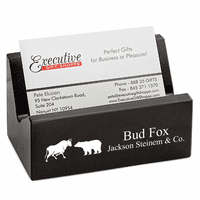 Dimensions: 8 1/4" x 5" x 7"